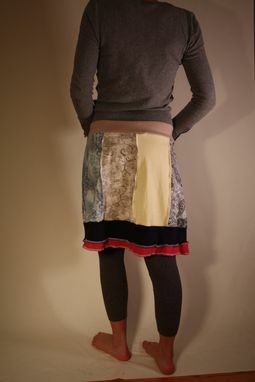 This eco/upcycled skirt features prints that are reminiscent of vintage garden trellis and cast iron gates, with delicate scrolls and floral patterns. Panels are an array of pastel shades and prints with a bright cherry red and navy blue trim along the bottom hem. A thick drawstring waistband ensures comfort and a precise fit. Garment is quite stretchy. Size large (12) and fits waist measurements 39" - 42" and hip measurements 41"-44"